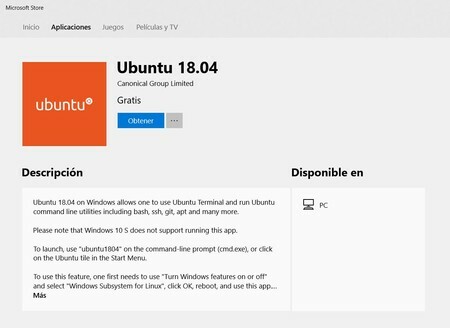 Canonical introduced late last April Ubuntu 18.04 LTS , the most exciting version in many years , and the popular distribution has now reached the Microsoft Store as a UWP application for Windows 10. As it did almost a year ago an earlier version still available. As we have explained on previous occasions, running Linux on Windows 10 as an application allows you to run a full Ubuntu terminal from the Microsoft system, with tools such as git, ssh, apt and bash , useful for developers and other professions. It is a way to take advantage of the characteristics of these distributions without leaving Windows, as can be done with Kali Linux thanks also to Windows Subsystem for Linux . Soon, in addition, Windows 10 will update the notebook with support for end of line Unix / Linux and Macintosh , which will facilitate a little more the task of administrations and users who need a compatibility that never arrived and it was not even expected. To download Ubuntu 18.04 LTS in Windows 10 just go to the Microsoft Store and search for “Ubuntu 18.04” or click on this link . Once in the application tab, we will simply click on the Get button and it will be installed. Then, to execute the distribution, it will be enough to launch it from the Windows Start menu. As in any Linux execution in Windows 10, if it is the first time that we use Windows Subsystem for Linux we will have to activate the function before carrying out the download and installation. Therefore, if we try before, it will not be downloaded. Once activated, the distribution can be executed as one more application. If we want to download and run the previous version of the distribution available in the Microsoft Store for almost a year we will have to simply search for “Ubuntu” or click on this link to get Ubuntu 16.04 LTS . Both versions are supported and published by Canonical itself in partnership with Microsoft as the company explained this week.